In addition to our ministries for students and children, there are various opportunites for adults to study, support each other and serve! Meets from 9:45-11:45 AM on 2nd Thursdays throughout the school year for moms who are pregnant and those who have children all the way to kindergarten. Homeschool moms with older children are also welcome. Childcare is provided. On 4th Thursdays we have the MOPS Café and most 3rd Fridays are Moms' Night Out events. (Childcare tpically not provided for those two.) 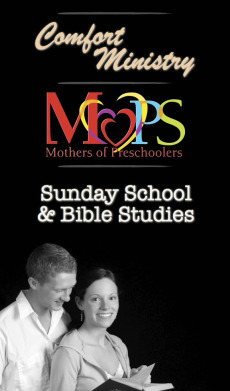 You can keep up with MOPS the various meetings and events on Facebook at www.facebook.com/mongulmops. Ladies' Study—Wednesdays at 7 PM—2nd Corinthians with the All Things New study by Kelly Minter. Pastor's Bible Study—every other Wednesday at 7 PM beginning March 14—studying the teachings of Jesus in the gospels. Get involved sharing God's love to others by making visits to homes, nursing homes and hospitals or by filling special needs that we've been made aware of. If you have a heart for the hurting, skills to fulfill various needs or simply time to sit with others or work where needed, contact us about serving with this ministry!